July 2015 marks the 150th anniversary of Wellington becoming New Zealand’s capital city. Ever since 1865, Wellington’s identity has been inextricably linked to its role as the seat of central government. Like other capital cities around the world, it has come to personify ‘the nation’, and is home to national institutions of all kinds – from Parliament itself to the New Zealand Symphony Orchestra, from Pukeahu National War Memorial Park to the national museum, Te Papa. Wellington’s capital status sets it apart from all other centres in New Zealand. Even if it wanted to, the city can’t escape its connection to Parliament, politicians and public servants. Other New Zealanders mutter about decisions ‘made in Wellington’ in much the same way citizens elsewhere moan about Canberra, Washington DC and other seats of power; sometimes they take their protests and petitions to Parliament’s doorstep, making Wellington a frequent site of demonstrations. ‘Politics is in the very air of Wellington,‘ wrote city ‘biographer’ Redmer Yska in 2006. Yska linked the precariousness of the city’s physical environment – a place of storms and earthquakes – with the political energy coursing through the veins of the world’s southernmost, and windiest, capital city. the MMP voting system was introduced under the Electoral Act 1993. Many New Zealanders today are probably unaware the country has ever had any other capital. Russell (Ōkiato) in the Bay of Islands briefly held the honour in 1840-41, before Governor Hobson moved his seat of power to Auckland. Following the first national elections in 1853, New Zealand’s inaugural Parliament met there on 24 May 1854, members gathering in a plain, unfinished ‘Shedifice’ on Constitution Hill, close to the present-day University of Auckland. Parliament’s location was a matter of debate for some years. For South Island members the long sea voyage to Auckland was a genuine trial in an era before New Zealand had railways or many roads – in 1854 some southern politicians got to Auckland in 12 days by steamer, but the less fortunate took two months by sailing ship. The issue came to a head as the populations of Canterbury and Otago grew rapidly in the 1860s. In 1862 one session of Parliament was held in Wellington, an exercise that almost ended in disaster when the ship White Swan – carrying the premier, other politicians and many of the government’s records – was wrecked off the Wairarapa coast. 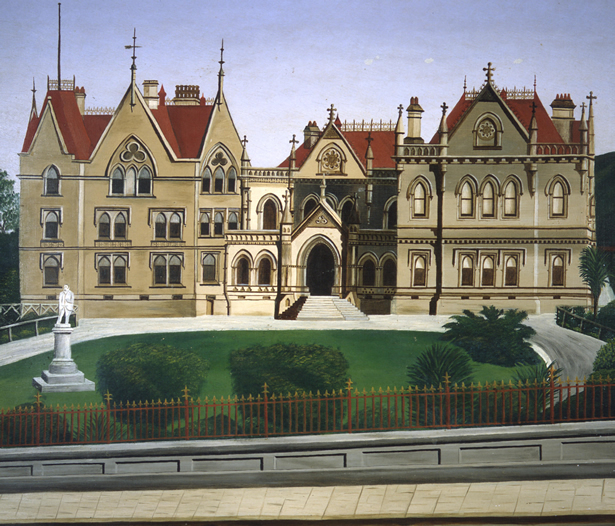 Parliament returned to Auckland in 1863 and 1864. Meanwhile, an independent commission chosen by the governors of the Australian colonies was charged with selecting a more central site for New Zealand’s permanent capital. After visiting Wellington, Whanganui, Picton, Port Underwood, Havelock and Nelson, at a cost of £4085 (equivalent to $450,000 today), they opted for Wellington. The move – a substantial logistical exercise – took place in early 1865, at a total cost of £54,665 (nearly $6 million). On 26 July 1865 Parliament met in its new home, the former Wellington Provincial Council chamber in Thorndon (a building that is now long gone). When the Wellington provincial government erected this building for itself in 1857, the local politicians – with a shrewd eye for the main chance – had laid out the rooms in a style suitable to host a future national parliament. Even northern members had to admit it was an improvement on the ‘Shedifice’. Though housed in a series of different buildings over time, Parliament has been in the same spot ever since. While Auckland reigns unchallenged as New Zealand’s largest city, international gateway and economic powerhouse, Wellington’s status as the seat of political power has ensured that this comparatively small city is home to a remarkable range of national institutions. The 32 venues participating in the city’s birthday celebrations on 25-26 July 2015 include political, constitutional and symbolic sites such as Parliament, the Supreme Court, Government House, Premier House, Archives New Zealand (which houses the records of government and treasures like the Treaty of Waitangi), and the national war memorial, this year redeveloped as Pukeahu National War Memorial Park; and cultural institutions such as Te Papa Tongarewa, the National Library, Ngā Taonga Sound and Vision, the Reserve Bank Museum, the New Zealand Portrait Gallery, the Royal New Zealand Ballet, New Zealand Opera, the New Zealand Symphony Orchestra, Toi Whakaari (the New Zealand Drama School) and Te Kōkī (the New Zealand School of Music). This article was written by Neill Atkinson and produced by the NZHistory team. We have 5 biographies, 6 articles, related to Capital 150.